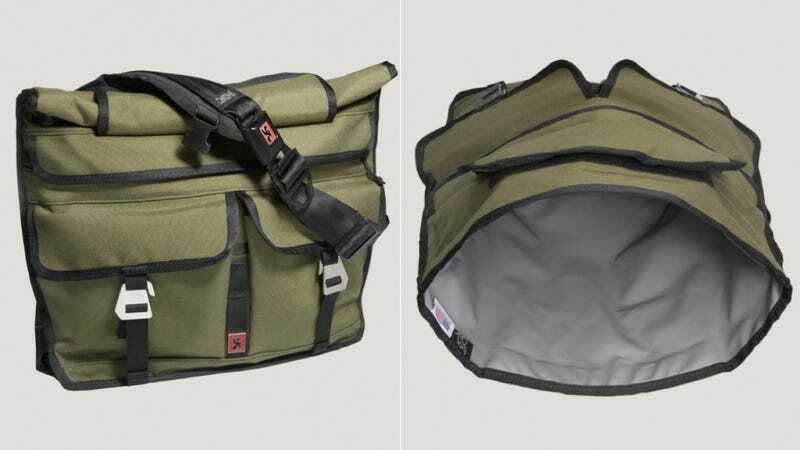 Chrome's new Lieutenant rolltop messenger bag combines the versatility and easy access of a messenger bag with the watertight seal of a rolltop backpack to make one tough bag. Doesn't hurt that it's got looks, to boot. The interior is fully lined with box-welded, military-grade truck-bed liner to ensure a waterproof seal that Poseidon himself would struggle to breach. This means your 17 inch laptop and other goodies stay dry when it's wet and miserable outside. Conversely, when it's warm and sunny out, feel free to throw in some ice and a six pack––the waterproofing works both ways. Even better, its dual interior compartments mean you can have beer, ice and steaks in one compartment and a sweatshirt and iPad in the other. If that's not progress then you need to lower your expectations.